Dragonheart is a band from Curitiba, Paraná in Brazil, they were formed around 1997, by the brothers Marco Caporasso doing guitars and vocals, Marcelo Caporasso behind the drums set, Mauricio Taborda in the bass and backing vocals, and Eduardo Marques as the second guitar and third vocals, they joined forces together and their influences which fall into the Heavy metal of the 80's, medieval and epic too, they began the songwriting process and by August, 1988 they released their first demo, titled "The Gods of Ice" with five tracks, and they keep on going; by November, 2000 they released their album debut "Underdark" for Megahard Records and almost two years later, "Throne of the Alliance" saw the light by September, 2002 under HTR and also the departure of guitarist Eduardo Marques, who was replaced by André Mendes, their third album "Vengeance in Black" hit the streets in 2005, for the German label Hellion Records, before they go in hiatus for a decade. "The Battle Sanctuary" is Dragonheart's fourth effort up to now, it was released the last October 2nd, 2015 supported by Pitch Black Records, this time; by the departure of Marcelo Caporaso, they brought on board a new drummer Thiago Mussi, let me tell you; what you can expect is a full dose of Heavy metal with lots of generic Power metal, yes! unfortunately for you this is an album that tends to be boring due to its length, reaching almost an hour of musical tragedy, their sound is for the likes of Portuguese, Ironsword or even the Swedish, Sabaton but not compelling as they are, my first impression about this album, was to recognize that they remain true to their roots, playing what they know best and preserving its mark on their music using three voices, something that is presumptuous, because while one guy tries to do clean vocals, the others guys are overwhelming with harsh vocals and the clean vocals loses any significance, musically there you can hear a lot of classic Power metal riff with some Thrash cords fused, adding an aggressive and solid sense, the guitar solos are not memorable as I wished. So, there is not enough to keep you tied for you to listen their tones. The album has few tracks that can be saved, Dragonheart decide to open with "Far from Heaven... Close to Hell", such of powerful and energetic, puts your expectations higher for what's coming, they throw some riffs to engage you, catchy choruses and unfold an unlimited energy, "Black Shadow" the second track is well structured from the beginning you can listen clear all the instruments, there is a bass line that plays amazing in the background, the clean vocals are outstanding, the guitar solo is one of the few memorable in the whole album, “Forged in Metal” there is some riff to remember, one of the most influential bands as Iron Maiden is, the drums by Thiago Mussi are great, while the choruses does what they meant to do, inflict an overdose of energy, I still have issues to conceive a clear idea of what they tried to do with the track number seven, "Marching Under the Stars"; the style and idea is clear some kind of Folk, Epic Power metal, but it totally breaks the flow, it is plagued in choruses that baffles me, the self titled track brings some groovy riff blended with plenty of thrash hooks, to engage you good enough, the battling vocals between clean and harsh, make a perfect contrast with the chorus, the last track is "Time Will Tell" is another of the few redeemable tracks, displaying lots of intensity and versatility for a good guitar solo, the vocals are acceptable, but again it fades in the attempt. 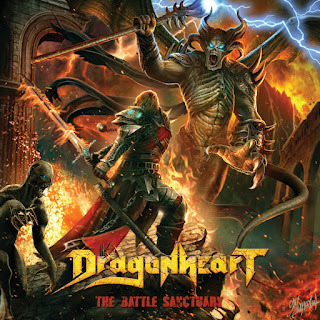 To conclude, Dragonheart delivers an inconsistent album, marked pretty much, for a standard songwriting, few eloquent and memorable riff and the abuse of three vocals, sometimes turning annoying or forgettable and last but not least the length, eleven tracks! almost an hour! 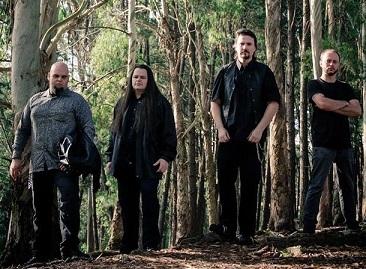 I truly believe is too much for a comeback album after a long hiatus, this album is recommended only for diehard fans of Power metal.